IP-Box 2 is a solution for repairing and servicing iPhones and iPads *. This high-speed programmer is for advanced users, proficient in iPhone/iPad IC chip removal. After the chip is removed you can read/write/repair it with the help of IP-Box 2 IC Reader. 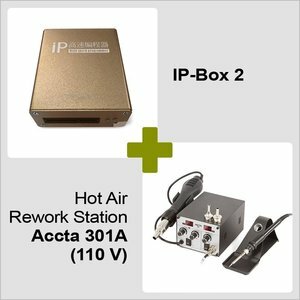 Accta 301A – dual-channel hot air soldering/desoldering station. Apart from the hot air gun, the package includes a soldering iron, hor air gun and soldering iron holders, a soldering iron tip and hot air nozzles. The default plug type is Type A. In case you need a different plug please contact our manager.